Be the first to share your favorite memory, photo or story of Lennis. This memorial page is dedicated for family, friends and future generations to celebrate the life of their loved one. 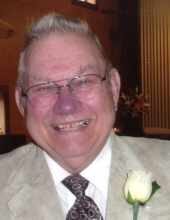 Lennis William Johnson, age 91, passed away on Wednesday, April 3, 2019 at Sutter Coast Hospital. He was born March 16, 1928, in Shelley, Idaho. He moved to Crescent city in 1949 and bought and ran the local skating rink. He met and married Arlita Eileen Briggs in 1950 and soon after joined the military. They moved back to Crescent City where he worked and raised 5 children. He continued running the skating rink and for the next 35 years was employed by the Pacific Power Company. Lennis loved his family and made them his first priority. He always said, “We’re making memories.” His strong faith in God was exemplified by his devoted service to others. He served as bishop for 17 years in The Church of Jesus Christ of Latter-day Saints. Later in life, Lennis and Arlita served a mission together in Missouri working to preserve historical records. He is survived by his beloved wife of 69 years, Arlita, his children, Lynn (Robin) Johnson, Pam (Don) Porter, Mark (Selena) Johnson, Nanette (Jeff) Mather, Kalene (Russ) Hohman, their 13 grandchildren and 19 great-grandchildren. Lennis was a kind-hearted man of God who will be greatly missed by his family and friends. All who knew Lennis are welcome to join the family in celebrating his life. To plant a tree in memory of Lennis William Johnson, please visit our Tribute Store. "Email Address" would like to share the life celebration of Lennis William Johnson. Click on the "link" to go to share a favorite memory or leave a condolence message for the family.